joy magnetism: Is anybody hungry? Dudes. 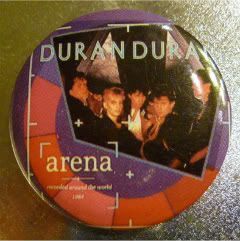 How is it that I have like four @duranduran pins magnets left? I think I'm wrapping up Duran Duran drop week with my favorite live album of all time. I have multiple copies - one cassette (shut it) and two CDs, maybe even three, plus I think I got desperate for it one day at work and bought it off of iTunes. What? There's a reason I know it like the back of my hand. And speaking of knowing something like the back of my hand - I'm well on my way with All You Need Is Now. If you haven't bought it yet, do. My dad was subjected to it for at least four or five hours today in the car. And without complaint, too. Mom just keeps asking every time we hear "Blame it on the Machines" who are these machines, and why are we blaming them?